At the March 22 session of the mentorship program, which took place at Menlo Innovations, Pattengill Principal Che Carter and Denise Murray from Briarwood Mall listen to Bryant Principal Roberta Heyward. Photo provided by Annette Ferguson. 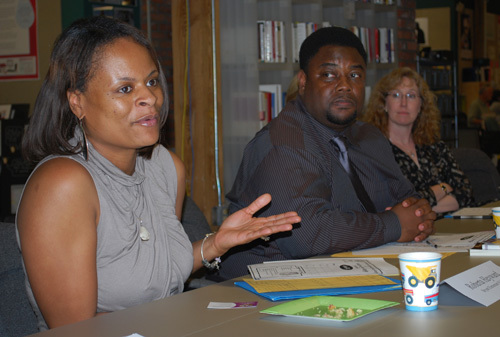 Principals in the Ann Arbor Public Schools are partnering with local business professionals in the Principal and Business Mentor Program. The goal of the program is to help principals learn new skills in customer service, while at the same time helping the business professionals have a greater understanding of the roles and responsibilities of the public schools. The principals are paired with the professionals in monthly activities that include speakers from ZingTrain, Sandler Training, Second-to-None, Menlo Innovations and Eastern Michigan University. Between meetings, participants visit each others’ workplaces for a homework-like assignment that continues the dialogue. Bryant Elementary Principal Roberta Heyward said she has learned plenty from her mentor, a DFCU Financial branch manager. Bill Harris, a first-year principal at Eberwhite Elementary, agrees. “I think the end result is that we can better connect with our parents and ultimately be more effective with the work we’re doing directly with the children at school,” he said. The program is sponsored by the Ann Arbor Public Schools Educational Foundation and the Ann Arbor Public Schools Partners for Excellence. Participating local businesses include: DFCU Financial, The Bouma Group Realtors, Comerica Bank, Edward Jones, Dannemiller Tyson Associates, Sandler Training, Simon Property Group and 360 Advisors. Participating schools include: Scarlett Middle School, Pattengill Elementary, Ann Arbor Technical High School, Wines Elementary, Eberwhite Elementary, Northside Elementary, Bryant Elementary and the Ann Arbor and Preschool and Family Center. The program began in January and has its last session in June at a Top of the Park event where one principal will receive a $500 grant from Johnson Controls. The company donated a total of $1,000 to AAPSEF specifically for the program. When the program is finished, it will be evaluated in the hopes of continuing it the next academic year, said Annette Ferguson, AAPS business partnerships coordinator. For more information, contact Ferguson at ferguson@aaps.k12.mi.us.